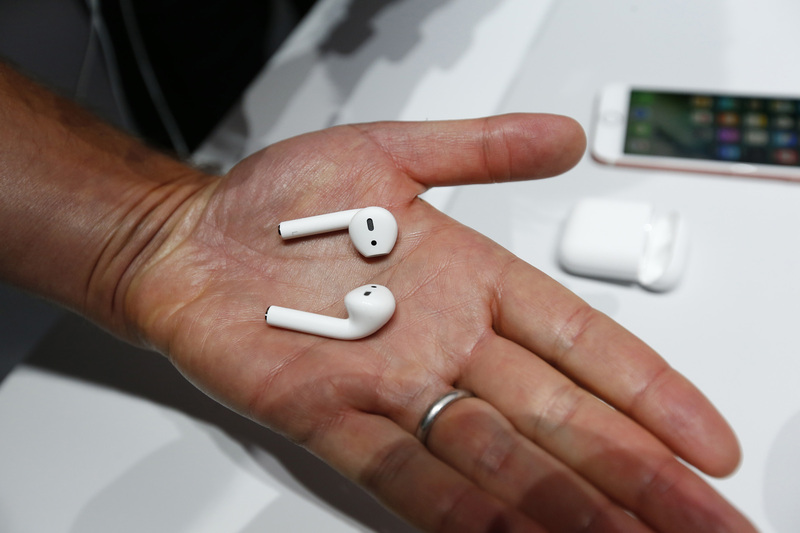 New wireless AirPods are shown after the debut of the iPhone 7 in San Francisco on Sept. 7. The iPhone 7, revealed this week, is a complete design overhaul, from hardware to software. And while the additions of dual telephoto quality cameras and water resistance are nice, the newest and most controversial feature, or lack thereof, is the absence of a headphone jack. It will be replaced by a lightning port to auxiliary cord converter for old earbuds and Apple-commissioned Bluetooth headphones. Let’s break this down. In my opinion, this is a poor move on the part of Apple. First of all, they’re alienating a large percentage of their user base who can’t afford the converter along with their new $800 phones, and the earbuds are $150 a pop if you lose them. This brings me to point two. The new earbuds are easier to lose, being two separate buds with no connecting cord. The price hike makes this even more of a travesty. Add to that the fact that Bluetooth headphones drain phone battery life more quickly than their corded counterparts. The new earbuds will also only hold a five-hour charge. This means if you don’t spring for the adapter or your fancy new headphones are dead when your phone battery is low, you can’t listen to your music while your phone is charging. Another issue to consider is that some cars don’t have any way of playing music from iPhones without an auxiliary cord. Even with the adapter, you’re out of luck if your phone is dying. Don’t get me wrong, I am a huge fan of wireless headphones. I love my Beats, and I use them all the time, but I still break out my corded earbuds when they die. Ultimately, I think Apple is trying to walk into the future, but this time, they’ve taken a it a step in the wrong direction.